SB 6203 (aka. the Governor’s carbon tax bill) just passed out of committee. This is the first carbon tax bill to make it out of committee in the 2018 session. You can expect intense negotiations, but there is still time to contact your legislators. It’s important we demonstrate strong support for carbon taxes, so legislators are compelled to act this session. 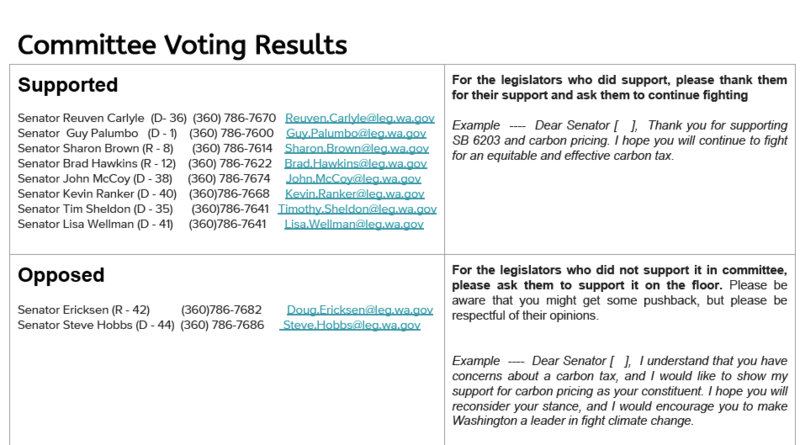 Here are names and contact information for legislators who voted on SB 6203 with a small script you can use. If your senator voted “yes” in the committee hearing, please thank them. If they voted “no” you can politely encourage them to vote “yes” on a carbon tax when it gets to the floor. Puget Sound Energy has pivoted and embraced some carbon pricing, and these bills have the support of IOUs (Investor Owned Utilities): SB 6424 and HB 2839.